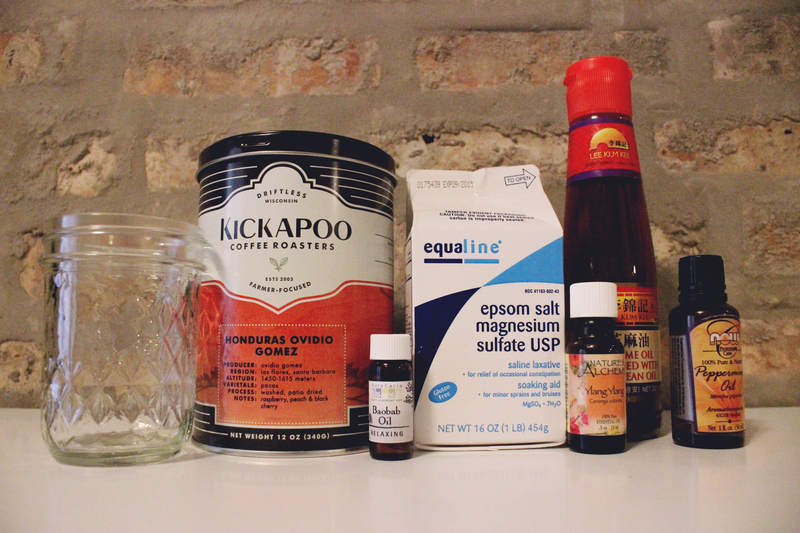 Lately I’ve been really into the idea of homemade beauty products. I buy a lot of shower-stuff from Lush, and I guess the fact that it’s all handmade has inspired me to do a little DIY. 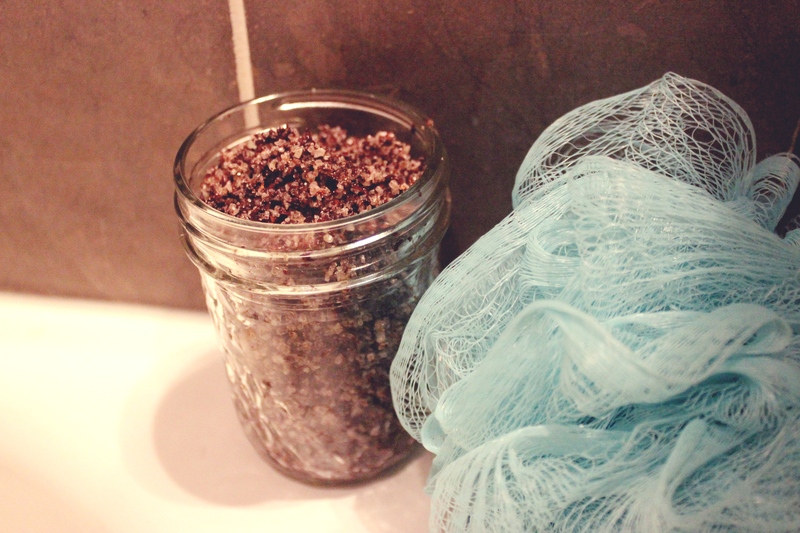 I saw a few different scrub recipes and decided to sort of wing it, so heres what I did! The ingredients I used, as you can see here, were: coffee (course ground), sesame oil, epsom salt, ylang ylang oil, and peppermint oil. You can also use used coffee grounds if you don’t have a crazy coffee abundance like I do. 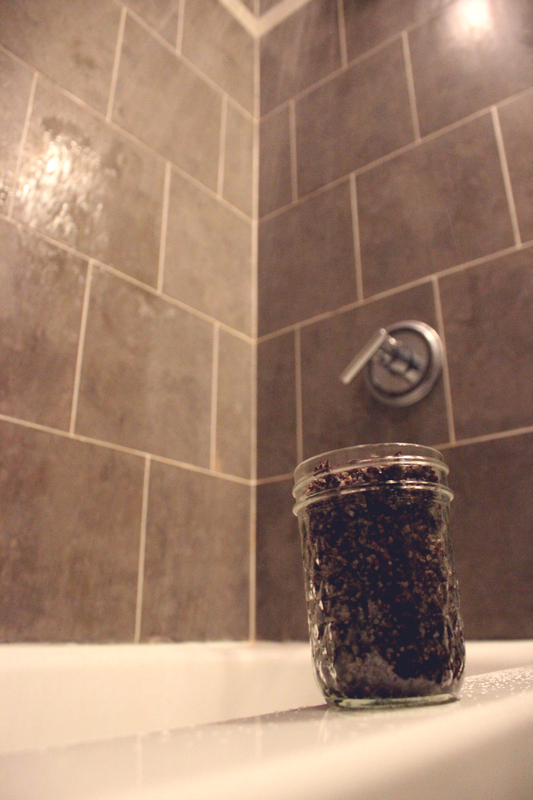 The basic idea is you mix even parts ground coffee and epsom salt, and then add oil until it makes a paste. I started with sesame oil, but I would not reccomend it. Something about the smell of sesame oil and coffee really grossed me out.. part way through the process I switched to some extra virgin olive oil. I would definitely just use olive oil (or any mild smelling oil) in the future, I really didn’t like the overwhelming smell of the sesame oil (though I do love it for cooking). I added ylang ylang and peppermint for aromatherapy purposes. Peppermint oil also soothes sore muscles (I use it sometimes for back/shoulder pain) so it’s a good thing to use for that reason. These were all ingredients I had on hand, but I would have rather used lavender than the ylang ylang, but I’m all out right now. The finished result is AMAZINGLY moisturizing and skin-softening. This was no surprise though, as I can remember my co-workings and I rubbing our hands in coffee grounds back when I worked at Lab Cafe. Coffee is a great exfoliant, as long as you don’t mind absorbing a little caffeine through your skin! So I would definitely make this again, but I would do it a little differently. I think the ratio of 50/50 coffee/epsom is totally great, but I would use a mild olive oil (or maybe even grapeseed), with rose, lavender, and peppermint extracts. I think that would produce a much nicer smelling result without compromising any of the positive traits of this scrub. !EDIT! Apparently toasted sesame oil and untoasted sesame oil are seriously different things with seriously different smells. I used toasted in the above recipe which is probably why I really disliked it. Who knew!